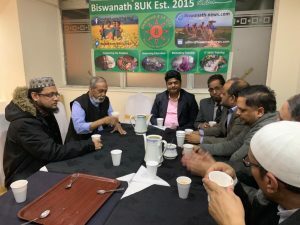 Biswanath 8UK an organisation dedicated to working for the habitants of Biswanath hosted a welcome event for Advocate Alamgir Chairman of Ramapasha Union and all their members and other Biswanathi people on Tuesday 12th February 2019 at Annando Mahal Restaurant in Luton. This meeting was attended by our chief guest Advocate Alamgir Chairman, Moulana Ruhul Amin, Monir Khan, S.I Khan, Azad Khan, Dilwar Hussain, Sundar Ali (Nozrul), Salek Chowdhury, Enus Ali, MD Nanu Miah. There were many other audiences with ancestral roots in Biswanath who came to welcome the Chairman and raise any concerns. 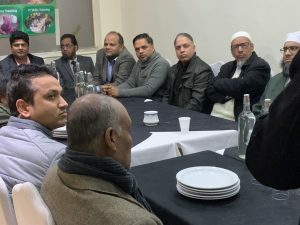 The purpose of this meeting was to welcome our chief guest Advocate Alamgir Chairman to Luton and provide a platform for our members and other Biswanathi people to raise any issues or concerns to the Chairman. Biswanath 8UK Secretary S.I Khan introduced the chief guest to everyone and co-ordinated questions from the audience. Our Biswanath 8UK Chairman Monir Khan also welcomed the guest and provided an insight into the aims and objectives of Biswanath 8UK and the work done to help disabled people in Biswanath. Moulana Ruhul Amin representing Biswanath Association also welcomed the chief guest and highlighted some of the projects he has been involved in and changes needed in Biswanath to improve people’s lives. There were many other welcome greetings, issues and concerns raised to the chief guest by Azad Khan, Sundar Ali (Nozrul), Salek Chowdhury and more. Key concerns and issues were around more support for UK Biswanathi people when visiting Bangladesh, Sylhet Airport staff behaviours, Support for Disable people, lack of Training, Education and Infrastructure in Biswanath. A meeting is planned by Biswanath 8UK on Monday 18th February in Luton to review the constitution and discuss ongoing projects. Biswanath 8UK is also planning a charity dinner party in June 2019 to be held in London to raise funds for one project selected by the organisation.